On this extension by CplusC Architectural Workshop, a combination of frosted, transparent and opaque louvres was chosen to control the heat, light, privacy and ventilation for the indoor spaces and, to an extent, the courtyard. Built into a limited available space, the extension has a feeling of lightness and space. Whether heard or not, young children should always be seen and sightlines from the family kitchen out to the adjacent indoor and outdoor spaces were central to this home extension. As well as the kitchen, the light-filled add-on includes a new living space, dining area, and adjacent courtyard, says architect Clinton Cole. 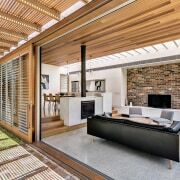 "Situated next to the kitchen, the living volume can open up to the sheltered, semi-grassed courtyard alongside via a giant operable louvred glass wall adding to the sense of openness by visually borrowing space from the outdoor area," says Cole. 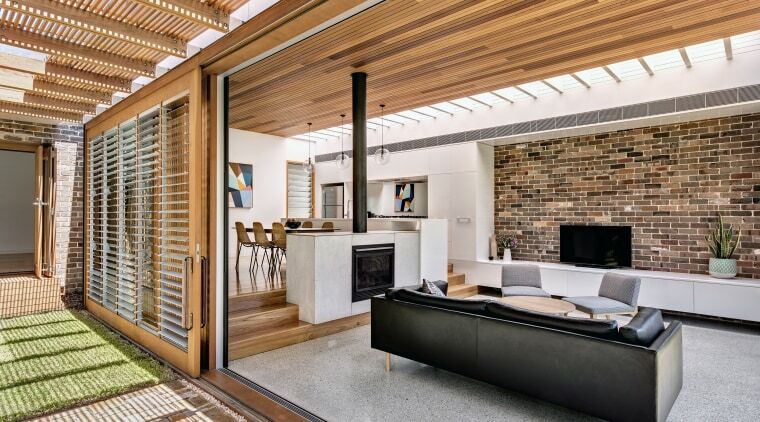 Sliding walls on this extension, the indoors becomes part of the outdoors with a push of large operable glass walls. 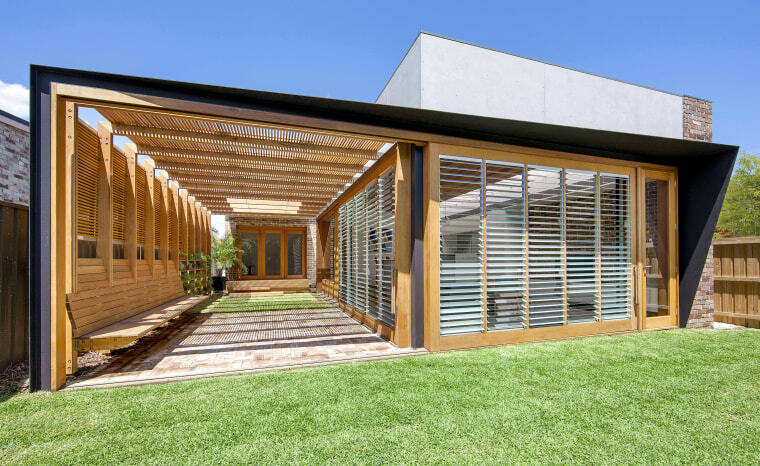 "A similar louvred wall slides across the outer ends of both the courtyard and the living area. 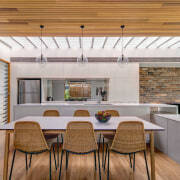 These open connections and louvred glass walls naturally provide sightlines throughout the extension, a must for the diligent parents." 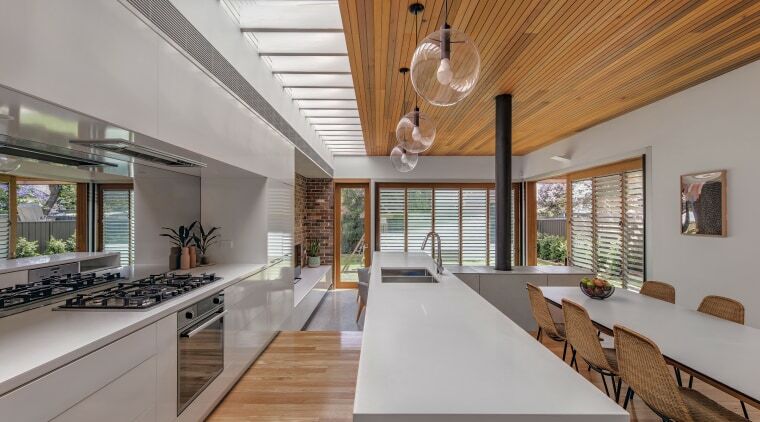 The understated white kitchen is designed to integrate quietly into the wider space, letting other dramatic material surfaces such as the recycled ruby red brick, cedar ceiling and tongue and groove floor lead the eye. However, the broad mirror splashback offers yet another way to keep an eye on young children's hijinks. Storage is naturally a priority with a family kitchen and there are extra deep drawers on the island and wall-height perimeter cabinetry. A fold-up cabinet front to the right of the outer countertop accesses a handy appliance garage. Close to the neighbours? Well, yes, but the mirror splashback is really reflecting other areas of this extension, while the near neighbours are completely screened from sight. The kitchen downplays its presence with recessed cabinetry handles, a concealed ventilation unit and a large appliance garage that keeps the on-show worksurfaces uncluttered. While the absence of windows here screens the kitchen from a close neighbour, a skylight running the length of the addition on this side provides ample task lighting. 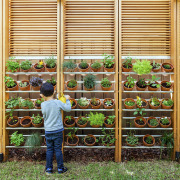 Cole's choice of materials in the kitchen furthers the indoor-outdoor connection too. 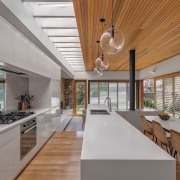 The cedar baton ceiling echoes the louvre elements while the Blackbutt tongue and groove floor connects with the pergola over the courtyard.